LA TRANIDAD, Benguet – The Department of Public Works and Highways–First Benguet District Engineering Office (DPWH-FBDEO) proposed to its central office the allocation of some P47 million to light portions of the Tubao-Nangalisan-Baguio Road, a newly opened alternate route leading to Baguio city, to ensure the safety of the travelling public, especially at night. DPWH-FBDEO District Engineer Ireneo S. Gallato said bulk of the funds will be used to implement lighting projects particularly in Barangay San Pascual, Tuba, Benguet where most of the critical portions of the road are located so that the safety of the travelling public will be guaranteed, especially those opting to use the alternate route at night. “We see the importance of installing the appropriate lighting along some critical portions of the Tubao-Nangalisan-Baguio Road, particularly in Barangay San Pascual, because of some stretches that are critical that warrant the installation of the lighting for safer travel, especially during night time,” Gallato stressed. The district engineer also recognized the importance of the presence of service centers among portions of the road to cater to the emergency needs of motorists who encounter defects on their vehicles while on the said road but warned interested investors to strictly observe the existing road-right-of-way because the agency will not hesitate to demolish any structures that will encroach on the established road-right-of-way of the new alternate route going in and out of Baguio City. Gallato expressed his gratitude to Baguio City Mayor Mauricio G. Domogan and the City Engineering Office for immediately acting on his request of removing the pressure pipe leading to the city-owned Asin minihydro power plants which was previously identified by the agency as one of the obstructions along the road for the safe travel of motorists. According to him, appropriate informative, directional and visible signages have been installed by the agency in various sections of the roadline to guide motorists who use the road contributing to efforts in decongesting Marcos Highway during peak days. 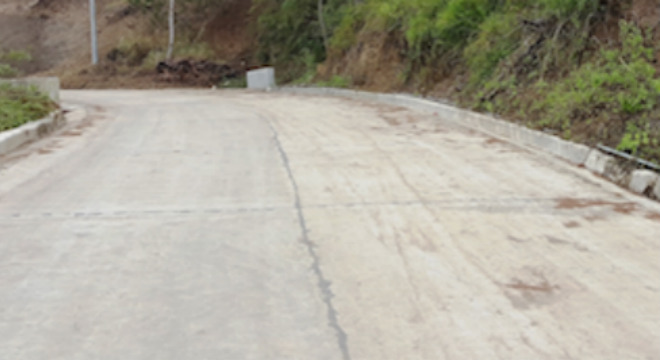 The Tubao-Nangalisan-Baguio Road was opened to vehicular traffic during the last quarter of 2018 after the completion of the Anduyan bridge in Tubao, La Union linking the road between La Union and Benguet. He claimed motorists wanting to use the new alternate route can also enjoy scenic spots on the way up to Baguio City, particularly the Asin hot springs, the BenCab museum and the wood carving village, aside from the zigzag and uphill portions of the highway similar to the zigzag route of Kennon Road and Marcos Highway.